Airline filters remove particulates from compressed air before delivery to a supplied-air respirator. The Barricade® 286 Airline Filter removes moisture, oil, odor, particulates, and organic vapors from compressed air and can be used as a component of a supplied-air respiratory system as required in OSHA regulation 29CFR 1910.134. Commonly used with supplied-air respirators for use in abrasive blasting, general cleaning, inspections, and painting and coating applications. The Barricade® 286 Airline Filter includes a seven-stage filtration process that catches and removes moisture, odors, organic vapors, and other particles from the air supply. This filtration process provides cleaner breathing air or source air. The Barricade® 286 Airline Filters are capable of supplying up to six outlets with conditioned breathing air with a single filter. 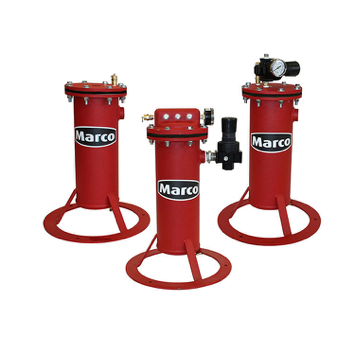 The Barricade® 286 Airline Filters can also be used to condition compressed air used to power pneumatic tools. A rugged, stable ring base with three stout legs, minimizes the chance of tipping associated with standard three legged bases. Three bolt holes allow for securely mounting the Barricade® 286 Airline Filter to a surface.